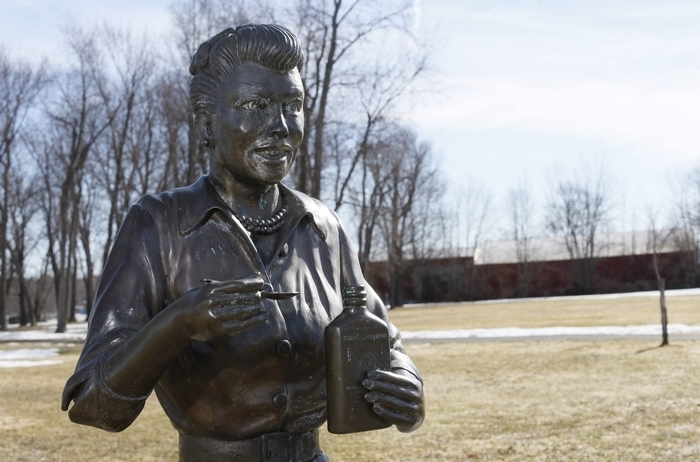 CELORON – Since 2009, the vacant bronze eyes of Lucille Ball have stared out from a picturesque park at the edge of Chautauqua Lake in this village of 1,000, where the legendary comedian spent much of her youth. No one here much likes the statue, and one look tells you why. It looks more like an extra from “The Walking Dead” than arguably the most famous comic actress of all time. Many village residents, including the mayor, the village trustees and even Jetta and Mark Wilson, the couple who engaged Jamestown-based artist Dave Poulin to create it and donated it to Celoron more than five years ago, will tell you they don’t care for it. Despite the fact that the statue bears almost no resemblance to its subject – despite the fact that its deranged grimace and jagged teeth inspire more dread than reverence – tour buses still stop at the park. People still pose for pictures with their arm around Lucy. And Celoron residents are still proud of their village’s role in the life of the First Lady of Comedy, even if some of them privately wish that the statue commemorating her would be struck by lightning. But earlier this week, an anonymous Facebook post turned up the heat on a long-simmering debate over the sculpture. That mystery Facebook page, “We Love Lucy! Get Rid of this Statue,” has perplexed village officials who have been quietly working to replace the statue’s head for the past several years. The renewed debate over the statue, which has made its way into the national news, has also reopened a political rift in the community that stretches back at least a decade. The sculpture is visible from Jetta Wilson’s office window in Village Hall, where she works as the village’s deputy clerk. For Wilson and others, it’s a constant reminder that no good deed goes unpunished – in her case a genuine desire to honor Celoron’s most famous resident with a tribute befitting her legacy. Wilson, worried about being dragged into a debate that could potentially embarrass the village, declined to be quoted. But Shirley SanFilippo, the village clerk and treasurer, spoke for her. For the Wilsons, who wanted merely to honor Ball in the public park that was already named for her, things didn’t go exactly as planned. For one, Poulin – who did not return a call for this column – took much longer than they expected to deliver on his promised sculpture, which was part of a complicated real estate deal he made with the Wilsons. When the statue was finally completed, all of its meticulous details, from the buttons on Lucy’s skirt to her bottle of “Vitameatavegamin” were in place. Except one minor issue: the face. In one of the funnier Facebook comment threads you’re likely to see on WIVB’s page on Wednesday, Western New Yorkers compared the statue to an unholy combination of untoward influences including “The Creature from the Black Lagoon,” Steve Buscemi, Josef Stalin, Yoda, the undead and a deranged, poison-distributing clown. Celoron residents, who were chattering about the renewed controversy on Thursday afternoon around the crowded bar of the Moose Lodge just down the street from the park, were a bit more polite. For Katie Streed, who was sharing a beer with her friends, the controversy seems to be much ado about nothing. Mayor Scott Schrecengost said that his attempts to convince Poulin to repair the sculpture at no cost have been unsuccessful. The estimated cost of replacing the head with a more lifelike version, he said, range from $8,000 to $10,000 – “and we’re not going to spend taxpayer funds to get the statue replaced or repaired,” he said. But that’s a drastic action no one seems prepared to make. As for the that anonymous Facebook page, whose author steadfastly declined to identify himself after repeated requests for his real name, some in Celoron see it as an attempt to embarrass the current administration. But no one dared name a possible suspect. In a town this small, many were just as happy to abstain from the debate. Village trustee Richard Kogut, who once went as far to put temporary putty in the sculpture’s mouth and eyes in an attempt to make it less frightening, went a little bit farther. But his solution to the statue debacle isn’t gaining much traction with other village officials. As for what’s next, Schrecengost said he hopes that all the publicity his village is getting might be used to find a solution that will please everyone.